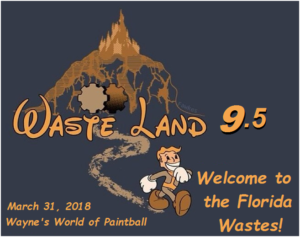 Wasteland 9.5 continues MGP’s Wasteland event series in this alternate reality event inspired by the FallOut computer games. Last fall saw surviving members of an Enclave task force establish a Florida base of operations in Crystal Springs, enlisting the aid of the Shadow Company Remnants. The cataclysmic battle with the Brotherhood of Steel attempting to eradicate the Enclave presence left Crystal Springs a shambles. Even in the Wasteland, nature abhors a vacuum. The survivors began to rebuild. Some returned while new ones arrived. With local survivors pretty much vilifying all the military orders and the destruction they wrought, a wilder, more chaotic settlement arose from the ashes. The residents of Crystal Springs look out for one another, with dozens of weapons ready to pop up and cut down any who disturb the peace without good cause. From out of the Wastes, a warlord set up within Crystal Springs… the Red Duke. His law, brutal as it often may be, helped provide stability to the settlement. But there are those nursing vendettas against the Duke and would like to see him fall. *** Important Note – We don’t know yet how much demand there will be for a second Wasteland game each year… so help us make this a success! This is being *planned* as a smaller event until we see registration numbers to support it. Initial planning will be focused on the southern half of the field, but if we get sufficient numbers we will expand to a full field game. We also intend to use this as a “sandbox” to test a few ideas for potential incorporation into Wasteland 10 in November… so be sure to review the players pack, particular the faction, the new skills rules being tested and the revised armor rules, to highlight several updates. Help us make this a big event! Pre-register online early and get your buddies to pre-register!